I was in Washington DC last week just after Memorial Day, and that has made me thoughtful. Generally speaking I do not like to glorify war. It seems to me that a country’s willingness to wage war is proof of its inability (or unwillingness) to resolve issues through diplomacy or other non-violent methods. In the best of all worlds, rather than be proud that we fought, we would be embarrassed that we had to resort to violence. There is no denying that many people have responded with their own bodies when diplomacy and other measures have failed. I hate to say they “gave” their lives. Instead they did not deny the call when their lives or health were “required” of them by a marginally grateful society. I am deeply moved by this collective action and hope that our nation will not squander such amazing generosity for trivial reasons. On this visit to the nation’s capital I was able to visit two war memorials which I had not seen before. Both were impressive but in different ways. accurately. 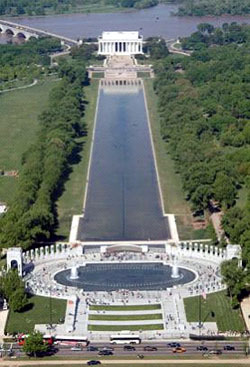 (The photo at the right shows how it fits in the Mall between the Lincoln Memorial and the Washington Monument.) I thought to myself, “Yes it is big, just like the war it commemorates.” Arches at either end commemorate the Atlantic and Pacific arenas. The fountain base in front of each arch cites the significant battles in that arena in chronological order. The 56 pillars around the oval name the 48 states and 8 territories of the US during the war. I did not see either of the two “Kilroy was here” engravings which Wikipedia says are included inconspicuously. Bronze bas relief panels between the pillars represent the range of activities of GIs and civilians during the war. I was pleased that among the inspiring quotes engraved on various surfaces was one extolling the contributions of women who stepped up to the demands of life at home and in the armed forces. 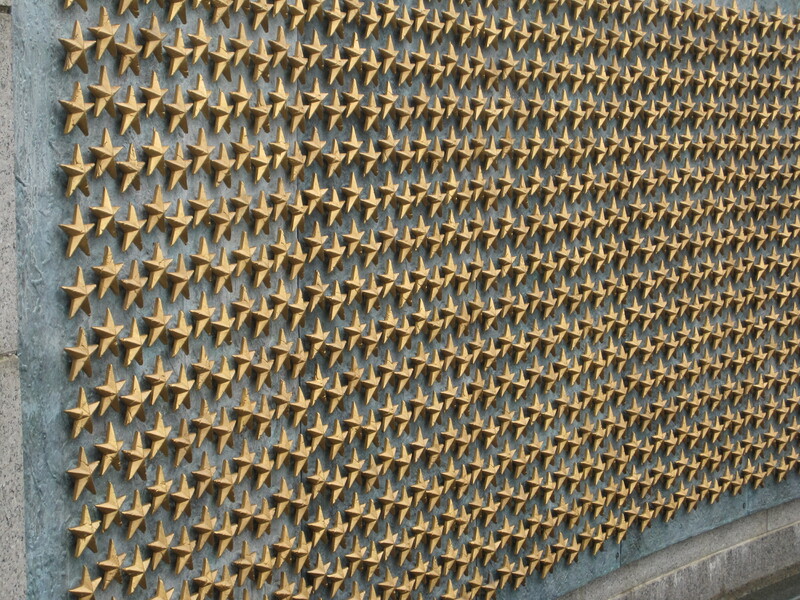 In the manner of the Vietnam memorial (which names every person who died in combat) there is a Freedom Wall with a gold star for every 100 service personnel who died or remain missing from the war (405,399 people). The entire effect is very sobering – and, as I said, BIG like the war itself. 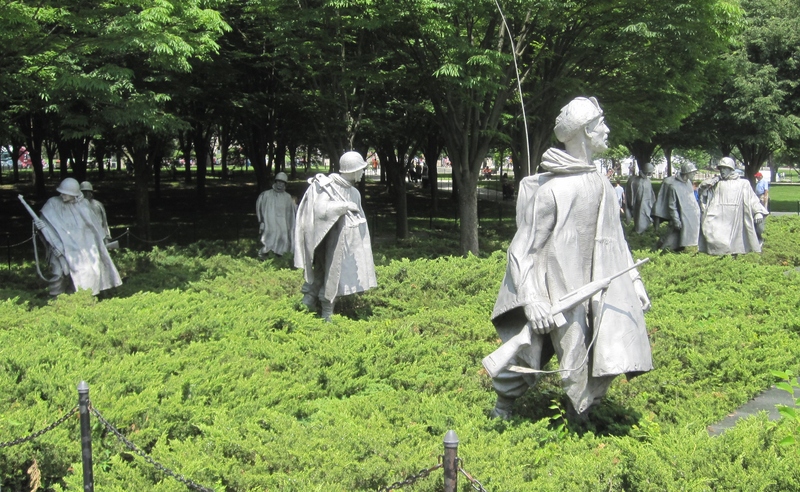 The smaller Korean War Veterans Memorial is also very sobering but for entirely different reasons. 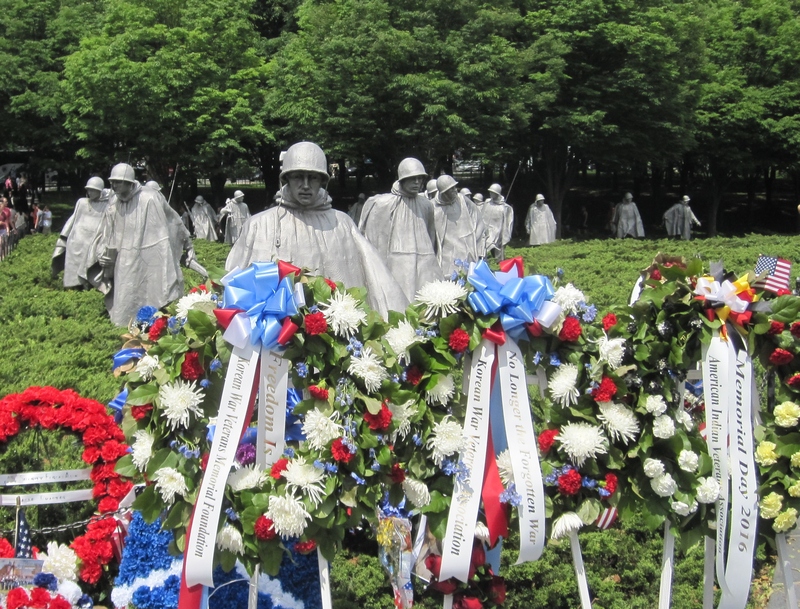 While the WWII Memorial is grand-scale the Korean memorial is very human and accessible. The central feature of the monument is a collection of 19 statues of GIs tramping together watchfully in full battle gear (including radio antennas through their ponchos). No matter where you stand in the walkway around their V formation, you are being watched by at least one of the monument’s figures. The variety and attention in their aspects makes it clear this is a group of individuals, watching out for any kind of threat. 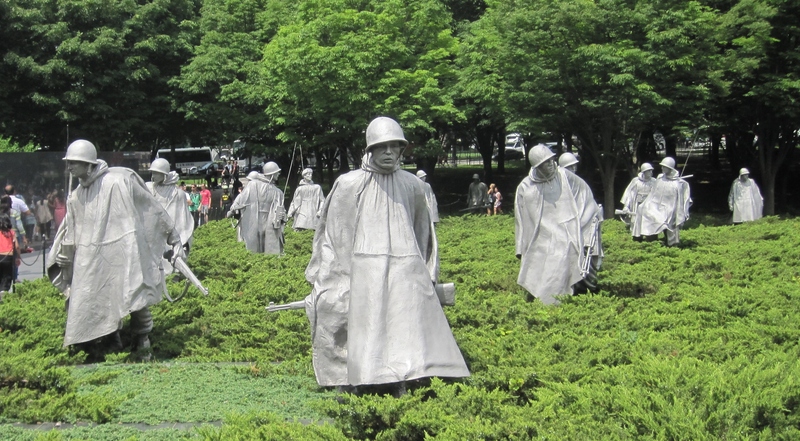 Other parts of the monument are a granite wall with photo images from the war sandblasted into it, and recognition of all 22 nations which contributed to the UN forces in Korea. The monument is tucked into a corner of the Mall, not easily visible from the street. These two monuments certainly have different presentations and atmosphere. Do they have different goals? I would hope one goal of both would be to prevent similar conflicts in the future. I realize that I might have unsettled some readers with these comments. What war monuments have been most striking to you? Please let me know your thoughts. 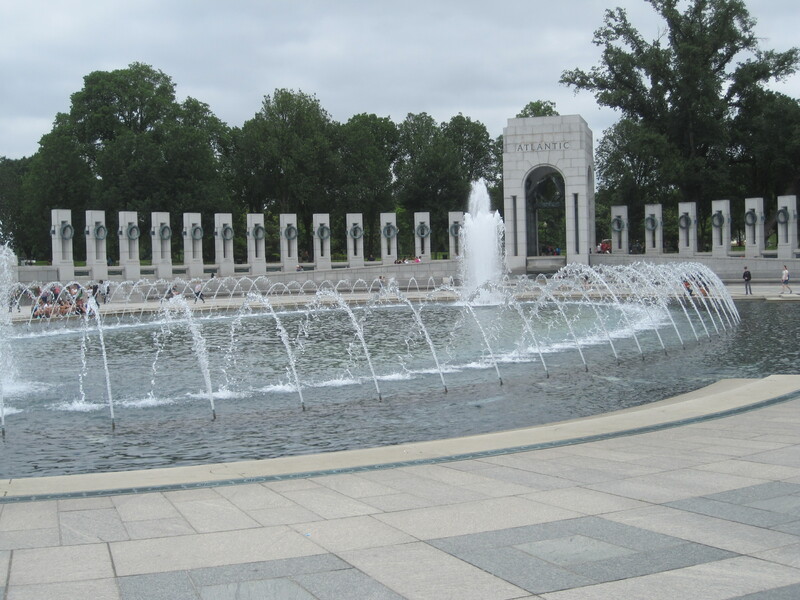 This entry was posted in Travel, Uncategorized and tagged Eisenhower, Kilroy, Korean Was, memorials, National World War II Memorial, statues, travel, war, Washington DC. Bookmark the permalink.